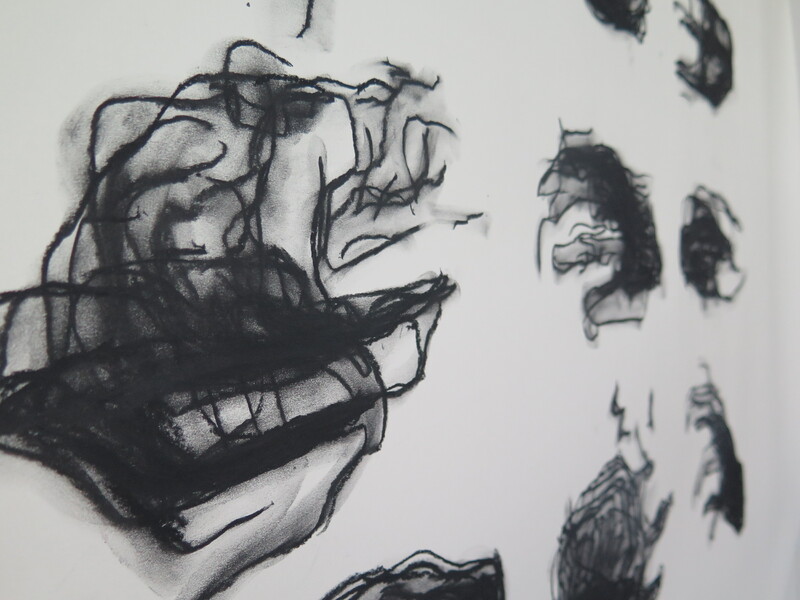 Last Thursday I used the system to make drawings live at the Autodesk artist in residence show. I created a CAD model of 12 hands arranged along different axis, converted that CAD file to G-Code, and used my laser guide to draw the G-Code while I followed by hand. After each mark, I used my palm to smear the charcoal in order to account for the presence of layers that would build in darkness as successive layers were added. I preformed the drawing live to emphasize the attention to being human (with all of the imprecision, labor, and messiness that comes along with it) in response to an overwhelming attention to technologies that are clean, virtual, simulated, and magical. This drawing took about four hours and the charcoal took about two days to be completely cleaned off my hand. 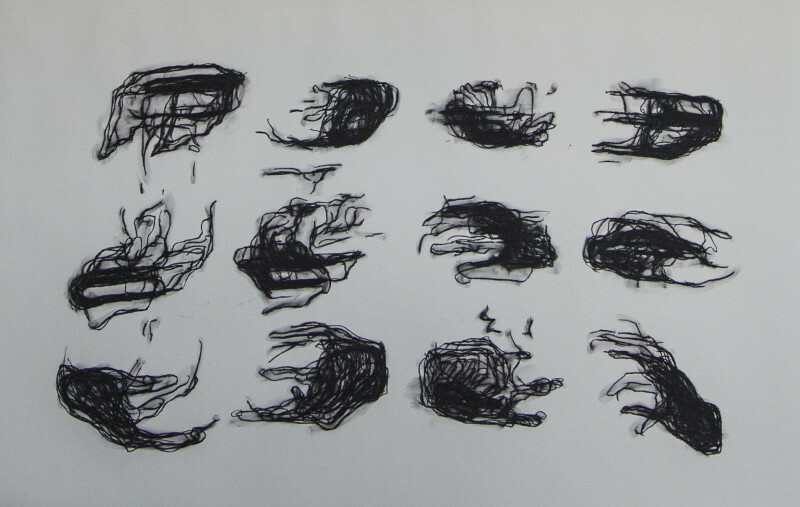 Drawing Hands from Laura Devendorf on Vimeo. Being the Machine: Balloon Process from Laura Devendorf on Vimeo. 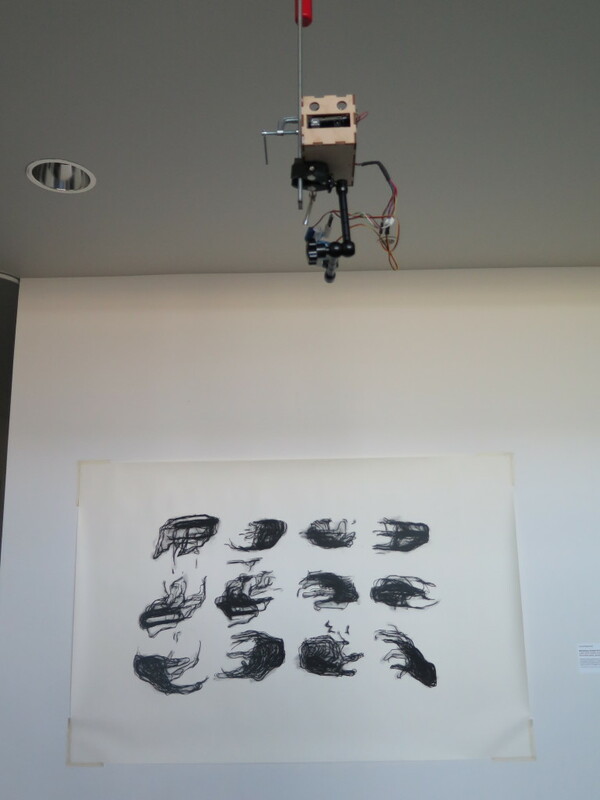 Redeform is an instance of the Being the Machine Project that I presented at TEI (a conference on Tangible and Embodied Interaction) last weekend. Having completed several small scale constructions of bunnys, guns, vases, I felt like I was ready to take on something larger scale and public so I decided that I was going to create a model of the Stanford bunny from balloons. I chose to use balloons primarily for practical reasons since they take up a large amount of space without a great deal of weight. Additionally, they are cheap and offer a sense of lightness and movement that I thought could be interesting when formed into a “3D printed” object. The Stanford Bunny is a model that has been used to compare different algorithms and machines. Given that the conference was at Stanford and attended by designers of interactive systems, I felt that the Stanford bunny could call the idea of “metrics of evaluation” into question when a model that is typically used to evaluate how precise something is, is repurposed to make something much less precise. I imagined a large (roughly 5′ tall) balloon bunny emerging from the system that I could toss around and even fill with helium balloons to make float. I really did feel that this was going to work, which foreshadows the eventual disaster that was to become of my balloon bunny experience. The building began last Thursday when I went down to Stanford to get a sense of the installation site and start prepping materials. I spent five hours that afternoon inflating 500 balloons (with an air inflator) and sustained 3 balloon related injuries: one chafing wound from repetitive knot tying, one torn cuticle from repetitive knot tying and hand cramping that lasted 2 days after the experience. I arrived at Stanford the morning of my demo at 7am and began setting up the equipment and my system. I started by trying balloons together with ribbon and then using my laser guide to position them and tape them down. I was feeling pretty good, this strategy was working. On the next layer, I kept tying balloons and weaved the ribbon with the previous layer to affix them together then added glue dots to stick the balloons together. 3 layers later, I was feeling proud of myself and confident that I’d see this bunny emerge. Lots of people stopped by to see what I was doing, I was a big hit with kids. Then a light breeze began to flow through the corridor in which I was building and wreaked havoc on my delicately stacked layers. The balloons didn’t want to stay in place and began folding over on themselves. 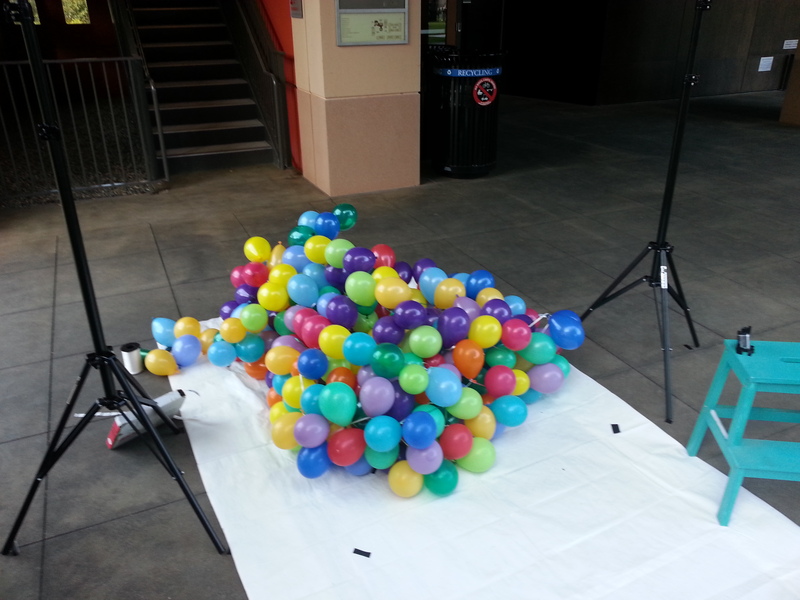 I took extra balloons and shoved them in the center in order to create support but to no avail. I stuck with it and kept building as best as I could. At five layers (5 hours into building), the model wasn’t pretty but I could see the shape of the bunny emerging. My back was killing me from bending over the model and I just kept sticking with it and made it to seven layers. It was clear that I was carefully constructing a pile of balloons. A few fateful breezes ripped by adhesives apart and “deformed” the model as I was attempting to re-form it. At this point, the labor of building this model had become a spectacle and multiple people had “checked in” on my to see if I was doing alright, to ask if I was fed an offer me something to drink. Some men came by to ask if I knew where to get food on campus and left saying, “good luck with your bubble art.” I began growing increasingly hostile to balloons, wind, and my stupid vision of a giant floating bunny. What was I thinking? First of all, balloons don’t want to be stuck together, they want to float with the wind, who was I to force them into this shape? Second, balloons are round meaning that they share a very specific and small space to be adhered with eachother, which means they can be easily ripped apart when the wind creates a ripple effect of tensions in the model. I began realizing that I was guilty of the very same claims that I built this project to be critical of. Why would I think that just because I’m mimicking the specific technology of 3D printing that I would somehow be able to defy physics or force materials to bend to my will. After taking a few steps away from the project and the 8 hours of labor that created a giant pile of conjoined balloons, I began to like the failure. This was being exhibited alongside other tech-art works that were all functioning beautifully and like magic. There was something about labor and futility that began to seem interesting and maybe even important in this context. Yet, when people asked me how it went, I couldn’t really hide the embarrassment of the huge amount of time I spent making something that didn’t work. I felt good about it, but it was still difficult for me to communicate that to others without sounding defensive or like I was trying to salvage any remainder of self-respect out of the experience. On Sunday night, at the public portion of the exhibition, I dragged my pile of balloons to the exhibit and set up the system to show how it worked and what happened. 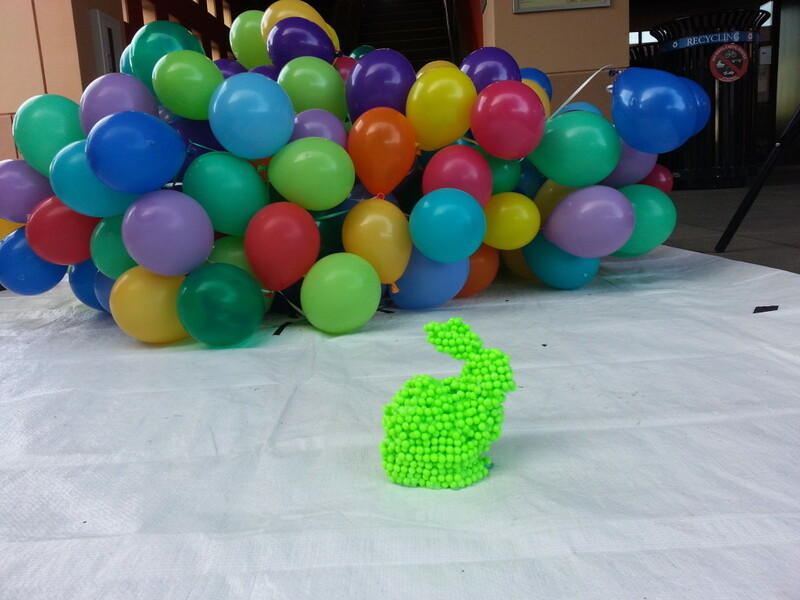 I juxtaposed the pile of balloons with a smaller version of the model created from pellets that looked surprisingly well done. It was fun to see this nice looking model next to an utter pile of crap. The people who visited my little setup were justifiably confused but after explanation of what had happened and my motivation for the work, I think people “got it” to some degree and began to share their own feeling about the relationships between digital systems and people in making, of which failure was a kind of necessary component. I was expecting to here a few more “too bads” or “I’m sorry’s” but I walked away feeling like this wasn’t encountered as a failed object but an interesting story about the great pains someone went through to create something only to find that the materials have a life of their own. 9 layers in and a few wind gusts later.